Height 5 feet 6 inches. Weight 154 lbs. Chest 33-36 inches. Complexion fresh. Eyes grey. Hair brown. Eyes both 6/6. Hearin & colour vision good. Limbs & chest well formed. Full & perfect movement of all joints. Heart & lungs normal. No illnesses. Free from hernia, varicocele, varicose veins, haemorrhoids, inveterate or contagious skin disease. Vaccinated. Good bodily & mental health. No defects. No fits. 19 March 1917 admitted to No. 7 General Hospital at St Omer - sick (mumps). Rejoined Unit on 19 April 1917. St Quentin Cabaret Military Cemetery, Heuvelland, West-Vlaanderen, Belgium; Memorial stone at Church of the Holy Innocents, Mount Peel. William John Rae, known as John or Johnnie, was the son of James Rae from Scotland and his New Zealand born wife, Eliza née Griffin, of Peel Forest, Canterbury. Born on 31 August 1890 at Peel Forest, he was baptised on 16 November 1890 at the Geraldine Presbyterian Church. John was educated at Scotsburn School, Peel Forest, and in the register has been inserted this comment – “Died for his country somewhere in France 1917”. The Raes were early settlers at Peel Forest and one of the families which gave the name Scotsburn to the settlement. His father was very likely the J. Rae who, in August 1914, contributed 5 shillings to the War Fund, specifically to the Ladies of Geraldine Equipment Fund. John enlisted on 31 May 1916, 25 years old, a shepherd, in good condition, single, of Church of England adherence, and residing at Lake Tekapo, near Fairlie. He nominated his mother, Mrs Eliza Rae of Peel Forest, South Canterbury, as his next-of-kin. He had previously served with the 8th South Canterbury Mounted Rifles until he was exempted. John was in South Canterbury's quota of the 17th Reinforcements to leave Timaru on 31 May 1916. After entertainment at dinner by the lady members of the South Canterbury War Relief Society at the Stafford Tea Rooms, the soldiers assembled at the drill Hall to be farewelled by the Mayor and others, and then left by the second north-going express. He embarked on the “Devon” at Wellington on 25 September 1916. After disembarking at Devonport on 21 November 1916 he marched in to Sling on that day. 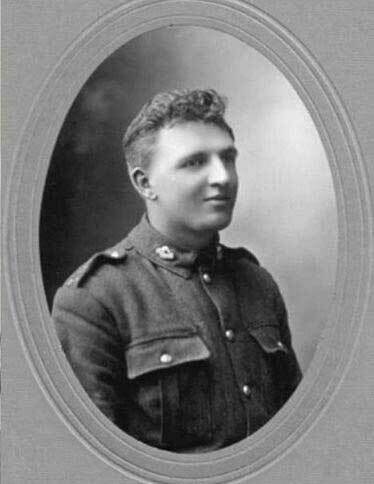 A month later he left for France where he was posted to the 1st Battalion of the Canterbury Infantry Regiment. From January 1917 the name of Private J. Rae, 17th Reinforcements featured in the list of men from the Geraldine district who had gone to the front, as published regularly in the “Temuka Leader”. On 19 March 1917 W. J. Rae was admitted to No. 7 General Hospital at St Omer – sick with mumps. Exactly a month later, on 19 April, he was able to rejoin his unit. But, as the New Zealanders were preparing to capture the village of Messines, . . . . William John Rae, 27357, was killed in action on 7 May 1917 in the Field at Messines, Belgium, 26 years old and one of twenty-nine deaths recorded in Casualty list 579. Private W. J. Rae is buried in St Quentin Cabaret Military Cemetery, Heuvelland, West-Vlaanderen, Belgium – just 1¾ miles west of Messines, and the burial place of 65 members of the New Zealand Expeditionary Force. On 22 August 1917 particulars from the official Army Form detailing his service were sent to his mother. There is a memorial stone to both William John Rae and his brother Donald Alfred Rae in the Holy Innocents Burial Ground at Mount Peel. His brother Donald died of wounds on the hospital ship Maheno on 28 August 1915. Alongside the memorial stone lie their parents. The Rae stones are near the big redwood tree in the bush. Much regret was felt for Johnnie’s widowed mother and his friends when news came through that he had made the supreme sacrifice “somewhere in France”. His father, James Rae, had died in November 1915, and now Mrs Rae was to lose a second son “in the great cause”. A notice in the “Timaru Herald” of 6 June 1917 conveyed the thanks of Mrs E. Rae and her family for telegrams, letters and expressions of sympathy in their sad bereavement. Perhaps she was the Mrs Rae who subscribed 5 shillings to the Geraldine Soldiers’ Memorial in August 1920. John was well known and had many admiring friends, especially in the Silverstream area. He was possessed of many admirable qualities. His medals - British War Medal and Victory Medal – were sent to his mother at Peel Forest, as were the scroll in 1921 and the plaque in 1922. By his will signed on 13 September 1916, William John Rae bequeathed all his estate to his mother, Eliza Rae. Exactly one year later the Public Trustee elected to administer the property of the deceased in terms of the will. In his short life John Rae had been a good saver, his property consisting of Cash in Savings Bank £219.19.10, Chattels £20.0.0 and Military Pay £20.0.0. His name is inscribed on memorials which reflect his birth place, his upbringing and his work places – Timaru Memorial Wall, Geraldine War Memorial, Fairlie War Memorial, St Stephen's Anglican Church, Fairlie, Peel Forest War Memorial (as J. W. RAE); St Mary's Anglican Church, Geraldine, and Ashburton War Memorial. The Peel Forest Soldiers’ Memorial was unveiled in September 1921 by Mr Hardcastle, the Mayor of Geraldine, who said that he was grateful for the privilege of unveiling the “memorial to brave boys who had lain down their lives for their country.” Bishop Julius observed that “New Zealand was richer for their death . . . . . and the sacrifice was not for anything tangible, but for righteousness and truth”. The monument stands on a commanding position, its simplicity adding to its effectiveness. The inscription on the pedestal reads – “In memory of the men of Peel Forest who fell in the Great War, 1914-1919” and following the names “Their name liveth for ever.” Among 17 names from this small country district are those of W. J. Rae and D. A. Rae. At the Geraldine Parish Church (St Mary’s) in late June 1924, a beautiful stained glass window and a brass tablet, erected in memory of men of the parish and church who gave their lives for their country in the Great War, were unveiled by Archbishop Julius. The church was filled to capacity, there being present many people from the outlying parts of the parish and many relatives of the fallen heroes. Perhaps some relatives of W. J. Rae and D. A. Rae were in the congregation. After the dedication of the memorial, “The Last Post” was sounded and the National Anthem sung. The window features Christ as the King of Glory above a soldier dedicating his sword to God. The ceremony was “very earnest and impressive”, and the psalm and hymns of a comforting nature. The inscription on the brass tablet reads “To the Glory of God and in grateful remembrance of these our fellow churchmen of the Geraldine parish who gave their lives for their country in the Great War, 1914-1918, this window is dedicated." The names follow, including those of W. J. Rae and D. A. Rae. Several Rae cousins also served in World War I – Adam, Alfred William (died of wounds in 1917), Bernard James and Robert Ernest, as well as William Rae Johnstone, and more distant relatives, Charles and William Irvine. Seven Rae nephews from one family (that of John’s brother Thomas) served in World War II.